Behind every great collection is an enticing marketing campaign. My husband and I are what you would call magazine junkies. We look forward to the days when the latest issue of Vogue, Harper's Bazaar, InStyle, etc. (in his case, Outside and Men's Journal) arrive in the mail. There is something thrilling about opening a hot-off-the-press magazine and excitedly flipping through its glossy pages. Not only do I enjoy perusing the articles, but also poring over the ads. Season after season, many fashion houses repeat the same old campaigns with little room for surprise - such as Calvin Klein's go-to black and white, Prada's vibrant colors with an artistic flare, and Dolce and Gabbana's luxury party scenes in the Italian countryside or by the sea. Rarely does an ad have the startling power to halt my incessant page flipping and cause me to take a second look. That's exactly what happened the first time I saw Alexander McQueen's 2014 spring/summer designs come to life in print. 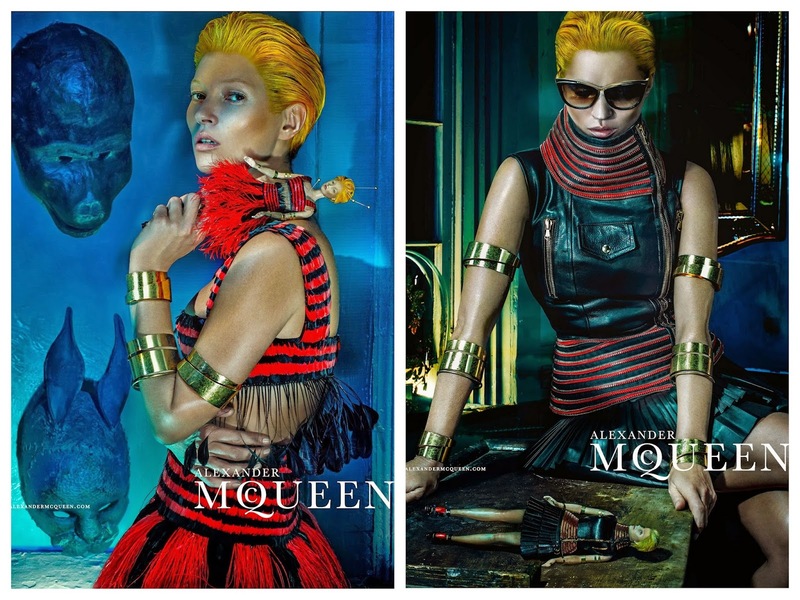 The photo shoot starred Kate Moss - her first time to grace an Alexander McQueen ad - and was captured by photographer Steven Klein on the streets of East London. Inspired by the sixties thriller "Peeping Tom" by Michael Powell, the adverts had an overall dark and foreboding vibe. Maybe this had to do with the disturbing miniature Kate Moss doll clone with shockingly yellow hair that was wearing high fashion McQueen designs? Whatever it was, it was a marketing act of genius. Although more than a little creepy, the Kate Moss figurine had nothing on the enormous Blythe dolls used in the display windows at Bottega Veneta stores worldwide to model their 2014 spring/summer collection. Creative Director Tomas Maier said, "The collection is about freshness and Blythe is known for her uniqueness as well as her sense of style, wears it effortlessly and with confidence. The result is surreal, reflecting a dynamic combination of elegance and modernity." The dolls were created in the seventies and later bought by Hasbro. They are wildly popular in Japan and have freakishly large heads and eyes. It's not surprising that they drew a lot of attention for the Italian luxury goods house. Quite a contrast to Alexander McQueen and Bottega Veneta's marketing strategies, Marc Jacobs chose minimalism for his 2014 fall campaign. At first glance, it looks as though mannequins are wearing his designs in the photographs. But in fact, models are strategically posed to mimic the lifelessness of mannequins. Although the Marc Jacobs print ads don't have the same impact as the peculiar dolls, they are still memorable, nonetheless. In the last few weeks, I made a loose fitting dress out of a stunning rayon and silk jersey. I also crafted a top using a textured fabric that I have used time and time again. It is durable, washable, and feels like superhero suit fabric, not to mention that it's made in Italy. Using my dress form, I created a new pattern to give the top contrasting diagonal lines with the same fabric in white. Then I added an exposed white parka zipper down the back and paired it with high-waisted pants that I made with a subtle houndstooth pattern. Using the leftover fabric, I fashioned a matching cuff-like accessory to go with each look.